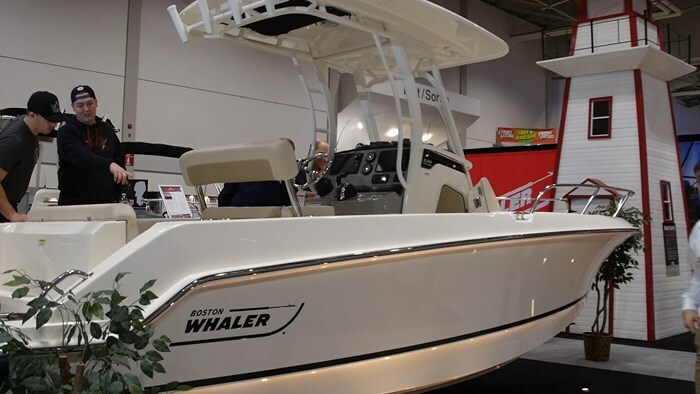 Boston Whaler’s Outrage line really does exemplify everything that is Boston Whaler. 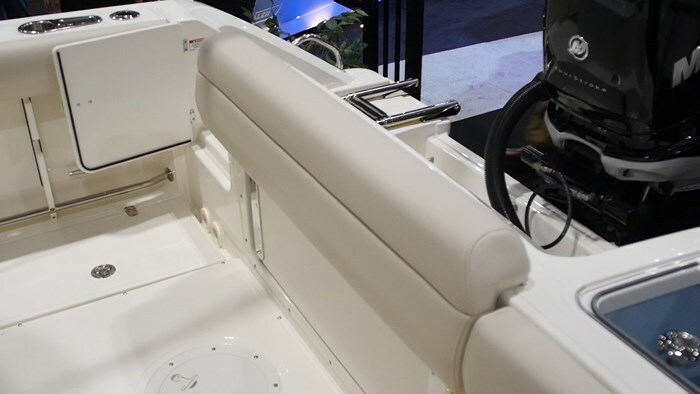 These center console boats are boldly styled and built not only for serious fishermen, but also for those looking for fine comfort, detail and everything that comes with the unsinkable legend. But that’s also why it’s hard to believe there was a hole in this legendary lineup, but there was and for 2017 this has been addressed with the introduction of the 230 Outrage. This 23-foot model features a trailerable 8-foot 6-inch beam. I think what’s even more impressive that it has a dry weight, with engines of roughly 5500 pounds. 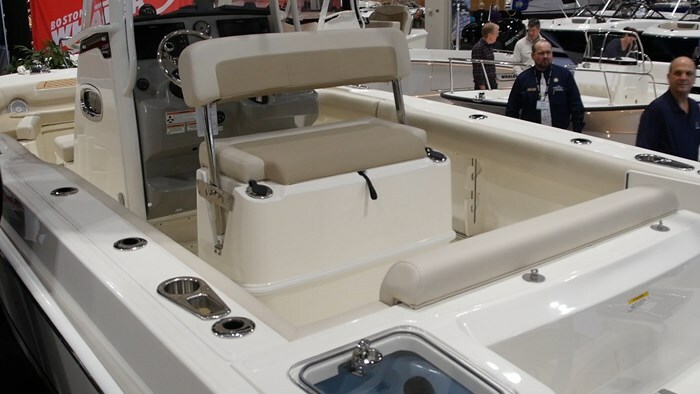 When standing next to it at the Toronto Boat Show I was blown away at the boat’s impressive stature, but what I am more impressed with about this new model is its trailer-ability. To think now you can take the 230 Outrage from lake to lake and tackle everything from lake trout to salmon, or just simply enjoy a day out on the water, because from what I have seen with the 230’s features, it can certainly do both! Entering the cockpit of the 230 Outrage through the starboard transom gate, you’re going to be immediately immersed in the fishing features of the boat. It starts first with the transom baitwell located at the port corner of the boat. There are rocket launchers located on the topsides of the gunnels, along with rod storage underneath them. There is room for more optional rod placements, but this model was fairly subdued. The sole featured a large fish box with an open floor plan. 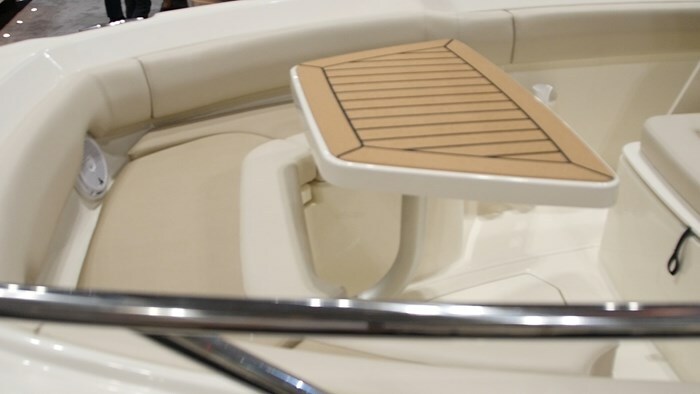 But when it’s time to cruise or relax, a bench seat easily folds out of the transom as the coaming bolster lifts up on hinges and the seat folds down with the coaming bolster acting as a back rest. I’ve seen seats like this in other Whalers and it’s a small part of what sets the boat builder apart from the rest. The helm leaning post features a multi-position backrest that swings fore and aft so it can be used as a leaning post or seat, in any direction. 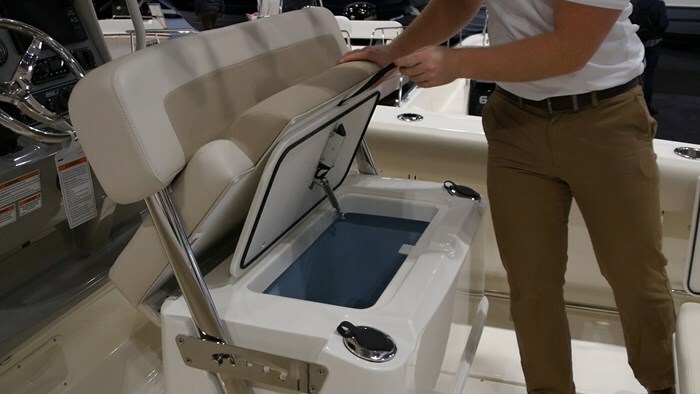 There is another fish box built into the seat of the 230 Outrage that opens up once you hinge the seat cushion up and out of the way. The helm on the 230 Outrage takes all of the good aspects of the other boats in the lineup and is almost so spectacular that it’s boring. I mean in a way it’s perfect. 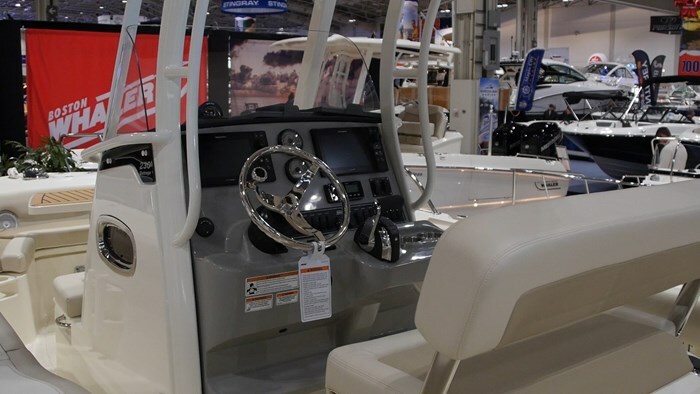 The wheel is mounted to the port side of the console, you have excellent line of sight, the DTS controls feel perfectly placed and it featured dual Raymarine touch screen electronics. What’s not to love? 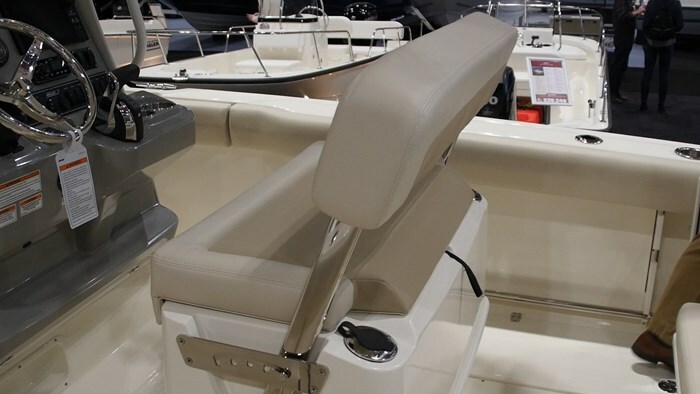 Entering the console itself through the starboard side door you will find the spacious day head on the 230 Outrage. This compartment was bright and airy even in the indoor environment of the Toronto Boat Show thanks to the portside porthole. 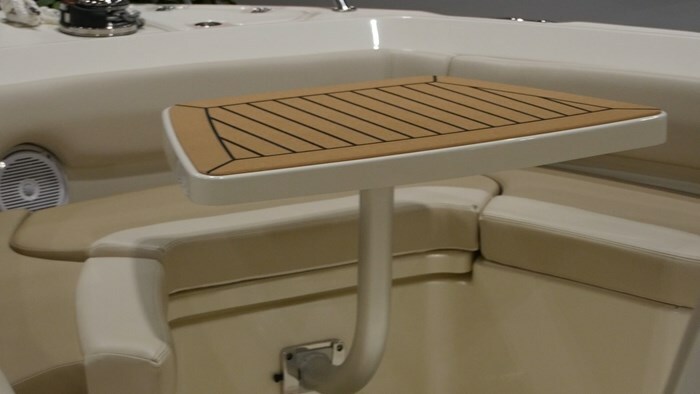 Passing around either side of the console up to the bow is made easily thanks to large walkways and should you need to the gunnel topsides are wide enough to stay sure footed to allow for multidirectional traffic. In the bow you will surround yourself with comfortable seating, forward of the console there is a forward facing seat with a bow livewell located under the cushion. 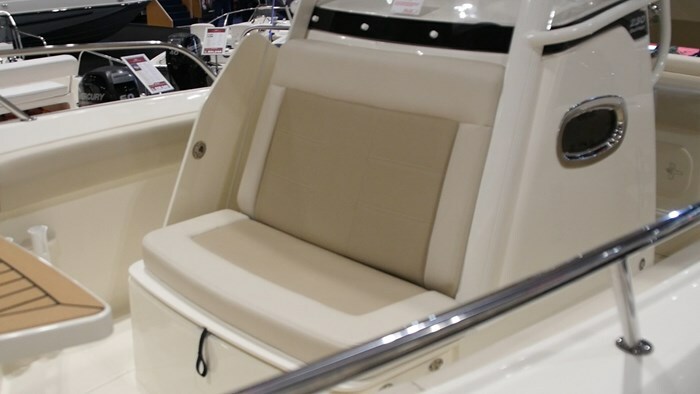 The plush coaming bolsters wrap all the way around the boat, up into the bow where they turn into comfortable backrests for the U-shaped bow seating area. There is a table with Teak finish that can pop in for snacks or cards, whatever you like. Fishing is always on the mind with this boat though as there are 4 rod holders up in the bow as well - you never know when that big fish will surface. Whenever I spend the time to walk through a boat at a boat show I am disappointed that I didn’t get to take it for a sea trial. This was especially true for new 230 Outrage since I know it has the seamanship of the legendary Outrage line.